If you have an S3 bucket at another company, you can migrate the contents of that bucket to DreamObjects within your panel. 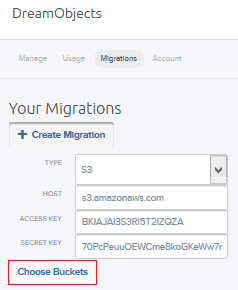 This article describes how to migrate an S3 bucket from Amazon Web Services to DreamObjects. Visit the Amazon Web Services Security Credentials page on the Amazon S3 site to obtain your 'Access Key' and 'Secret Key'. Navigate to the DreamObjects page in your DreamHost panel. 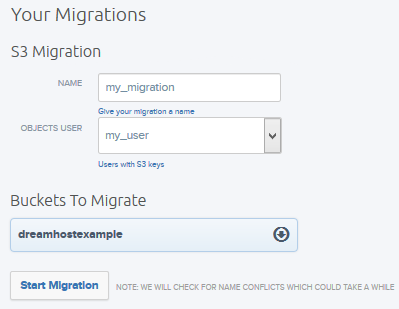 Click the + Create Migration button. Type — Set to S3. Access Key and Secrete Key — You can locate these in you AWS account. Click the Choose Buckets button. A list of your S3 Buckets opens. By default, all of the buckets are highlighted and selected. Click a bucket to un-select it. Enter a name for your migration. The name is for your use only. 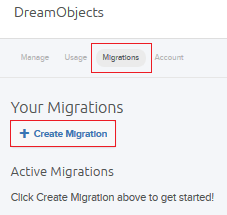 If you have more than one DreamObjects user, choose which one you'd like to use for the migration. Click to select or deselect the buckets you wish to migrate, or use the Select All or Select None buttons. Click the Start Migration button. If the naming conventions used for your S3 buckets are not compatible with the naming conventions for DreamObjects, a 'Bucket Name Conflicts' screen appears. Currently, bucket names using capital letters cannot be imported because capital letters can create DNS issues. If you have S3 Buckets that use capital letters, you are asked to change their names. If you wish, you can use dashes or dots to separate words. Bucket names must include at least 3 characters and can only contain lowercase characters (a–z), numbers (0–9), hyphens (-), and dots (only a single dot at a time, and cannot end in a dot). Though certain symbols such as dashes or dots are valid, they will break DNS on your bucket name (reducing the bucket’s functionality) and are not recommended. To avoid any issues, modify your bucket names to resolve any naming conflicts, and then click the Resolve Conflicts button. Click the View Details button to view information about the migration. For example, you can view the current status, how long it's been processing, and its current state. Queued — the Bucket and all of its objects have been successfully copied to DreamObjects. In Progress — the Bucket is in the process of being copied to DreamObjects and has not yet completed the action. Stopped — the migration process for the Bucket has either failed, or was manually stopped by the user requesting the migration. Partial — some Buckets and their contents have been migrated, and some have not. This may have been caused by a failure during Object Synchronization. Such failures can be caused by deleting your S3 Buckets, or by revoking your S3 credentials before the migration is complete. Complete — the Bucket and all of its objects have been successfully copied to DreamObjects. Article last updated April 11, 2019 16:08 PST.